Windows Vista's file backup feature doesn't warn you when you when your backup disk is full. That's according to SmithMicro 's Brad Peppard. Peppard showed his company's new Stuffit Deluxe and EMC Retrospect Express HD backup software to Tech.co.uk this morning. But he also had a warning for buyers. "The backup in Vista is flawed...if you use an external hard drive for backup, it doesn't tell you if the disk is full. So you think it's backing up your data - it's not." The flaw is surprising of Microsoft - though backup hasn't been one of Vista's most-trumpeted features. 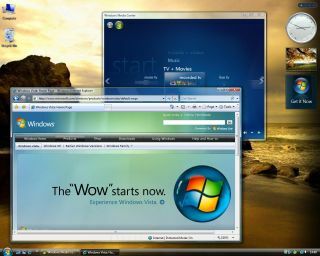 Peppard says the reason Vista's backup isn't better is that Microsoft was "trying to do too much." There are several different apps within the new OS that facilitate backup. As well as the System Restore function formerly found in Windows XP. Also in Vista is the File Backup and Restore utility plus Shadow Copy. The latter function creates incremental backups of files you're working on, though it's only available in the Business, Ultimate and Enterprise editions of the software.